Humanity may be in equal parts both human and inhuman, but to be inhuman is in fact a part of being human. Nothing man does is outside of nature, as unnatural as his acts may seem to idealistic eyes. Good and bad, folly and prudence, all have their origin in the primal ooze and the structures risen from it. Mysticum return to pursue this same train of thought after a long hiatus; their music is a discrete composite of industrial sounds and the black metal of their native Norway. It is a quaint and uneasy mix in a black metal universe considerably different from the time of their cult debut; dissonance now presides over tonality, images above substance. Old enemies have grown tired and insipid, so the genre spins its wheels, and though musical conviction can only ever be subjectively interpreted by the listener based on his own prejudices, very little reaches out and grabs him by the throat like it once did. Mysticum‘s style is quaint and rests in uneasy near-equlibrium just because it juxtaposes the human with the inhuman. Can it be denied that there is real, personal feeling in all great black metal? It is often contended that black metal is the culmination of metal evolution, and if one considers the emotional narratives potentially available to this genre when done well, that contention seems based on solid ground. Black metal, in all its vitriolic glory, is essentially a human endeavour, rife with all the caveats that such a term proposes. Mysticum, for the most part, suitably capture this human spirit; their black metal is along traditional, Scandinavian lines, albeit of a slightly monochromatic tone. It is admirably constructed, and when dressed with industrial-grade bells, whistles, and percussion, conveys something approximating a martial pose. A strange confluence this; a steady crackle of futuristic static pervades all of Planet Satan and drums are often a summons-to-march, but above it resonates the most conventional of black metal, leading one to believe that Mysticum‘s synthetic flourishes are little more than a curiosity and a distraction. The melodies themselves are serviceable and arranged in competent, undisgraceful fashion, but Mysticum, to me, have never carried that spark of true inspiration that was a hallmark of their more renowned countrymen. Every artist has a palette of colors; some may have more colors than others, but even if you had an equitable distribution of colors among all, the new color resulting from a mix of what has gone before can still be fiercely individualistic. Mysticum have always had a well-equipped palette, certainly more so than many a modern band, but their mixes leave me somewhere between interested and indifferent. 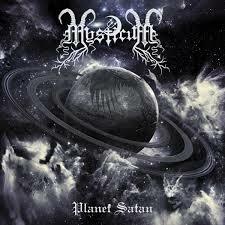 This entry was posted in Black Metal and tagged Black Metal, Mysticum, Norway, Planet Satan. Bookmark the permalink.